So, last week was not the best week for the Lewis family. The quick summary is that I started having health symptoms that are scary, and the cause was likely linked to problems with my heart and blood. So, after lots of fatigue, dizzy spells, heart monitors, doctors visits, and obsessing over fine details about what possibly be causing the problem, I am finally getting (sorta) better. The rest of this post includes finer details of this for those who are interested, because who doesn’t like to read the many details of other peoples’ health problems? My pregnancy (then at 19 weeks) had been going along pretty smoothly with only minor symptoms. I had been getting treatment for low progesterone (shots & prescription), but other than that, I told Josh that this pregnancy was “a gift from heaven” compared to my last pregnancy. Then I went to the car show. On June 20th, the Lewis and Petersons clans went with Pop Lewis to the 50’s Car Show at the MN State Fairgrounds to celebrate Father’s Day. While there I experienced ringing in my ears, followed by sweaty chills, then crazy vertigo, and then everything in my vision “folded” and turned to blackness. I was able to sit down and get back to some sense of normal by eating a bratwurst smothered in kraut and drinking a coke. I chalked this episode up to being hungry and hot. So, I called the doctor and she had me come in. They did a bunch of blood tests & other tests, but here are the results that are pertinent. My blood pressure was 90/56. My resting heart rate was 115. That’s bad. My blood work turned out normal except that my iron was borderline low. 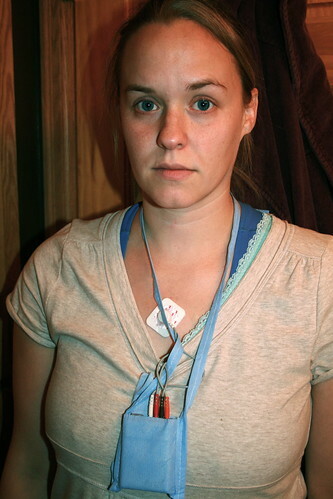 So, I was sent to the hospital to get a Holter monitor. Luckily, this test showed that my heart had no abnormalities, other than an elevated heart rate. After talking with the cardiologist and pouring over my medical history, the doctor found that less than 1/2 of 1% of patients receiving progesterone [shot form] had the symptoms I was having. So, they took me off the progesterone shots and I’ll continue taking my daily progesterone prescription. Because of my borderline low iron, I started taking an iron supplement. Because of the messed up blood pressure and heart rate, I now have a really fun diet (no salt, no sugar, no bad oils, etc.). That, and I get to monitor my blood pressure and heart rate for the remainder of this pregnancy. I have to call the doctor if my pressure goes under 90/60 and my resting heart rate goes over 100. While all of this is a pain, it has so far been helping me feel better. I still get tired and mildly dizzy, but so far no blacking out and no vertigo. Because my last pregnancy ended in preeclampsia and HELLP syndrome, it is important that we watch my progesterone levels in this pregnancy through to the very end. It is also important for the health of the baby that my progesterone levels remain high and stable. Because the prescription progesterone has unpredictable absorption rates, unlike the shots which are in the high ninety-percentiles, I may end up “taking one for the team” during this pregnancy. That means I would need to start the shots again and go on some kind of bed rest to keep my blood pressure and heart rate as close to normal as possible. So, I’m pretty much walking a fun line between kidney/liver failure and losing the baby OR heart failure. I think with all the progesterone monitoring and heart monitoring it should be pretty manageable. Not fun, but manageable. However, prayers are certainly appreciated! Also, if you have any really good heart healthy food recipes, please send them my way! I mean, seriously, no salt, butter, or sugar? It’s getting rough on me. Wait, there is one good thing from all of this. My doctor told me that when I feel really weak and my blood pressure starts dropping, I should have a couple of cups of coffee. The caffeine raises blood pressure! WOO! I told Josh that I think I should start doing our taxes for next year, if that doesn’t raise my blood pressure, I don’t know what will. Hi,Stephanie…I’ve been lurking for quite some time. We met at Helen’s 2003 bridal shower. After Helen’s 2003 wedding I went to your blog for pix, I believe. I’m not sure I had ever met a blog before – or anything like it. Now I pop in every once in a while, and love to see your pix of Caleb, and now New Guy. I’m sorry you’re having trouble in the midst of your joy. Personally, even at a whoppin’ 60(!) I would still prefer my joy unmixed, left to my own devices (which thankfully I am not). But heh, we know Who knows best, right? You probably know the verse “Trust in the Lord at all times, O people; pour out your heart before Him” (Psalm 62) I believe this is one of those “at all times”, tucked right in with all the joy. What a blessing you have a focused 2-year old – who loves to paint!! While I was carrying our son, I had a health wake-up call and needed to become absolutely intentional about what I ate and when I ate it. The main clue I have for passing on to you is…foods as God made them can be enjoyed tremendously, without salt, sugar or bad oils. I’ve probably never felt better than I did during those months. Walk the produce section – organic if you can – or send someone else on your behalf. Look for color, color combos, vitamins, texture combos, smells. Eat them raw, eat them steamed, or steamed and then chilled. Send them through the blender? the juicer? Thank God for all the wonderful nourishment you’re receiving and New Guy will receive. Can you have fruit? You can wash various fruits/berries, cut bigger fruits in dice or slices, and give them an hour or so in the freezer – gives you pause while you’re eating them, to enjoy them all the more! And everything you eat will be OK for Caleb and Josh, too, I would guess, even if they would prefer to have a little dressing on a salad, or non-mommy add-ons. Meat is a little trickier without salt, but how about using garlic? onions? spices? You mentioned “bad” oils. Does that mean you can have canola? olive? Then you probably can have bread? – as long as you don’t put salt in it? (I’m thinking bread made at home – with canola or olive oil instead of butter – from a bread machine?) It’s kind of liberating to step back from “recipes” for awhile and fly solo with the kitchen thing. OK. It’s 12:38 a.m. and I’m getting ramblier and ramblier. So I’ll sign off, except to say we’ll be praying for you and in case you hadn’t heard – Helen and Tim will be at her folks’ house soon. Email me if I can help?….with bread recipes, etc…. ?